UL approved for hopsital use, the Kinetek Performa Knee CPM machine features a leg carriage designed for automatic motion. Adult and pediatric capability. 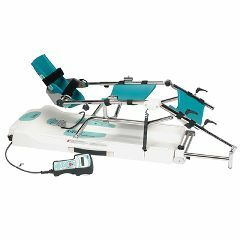 Features waterproof computer, quiet operation, programmable muscle stim capability, carrying case for easy transportation, built-in therapy timer, attached sliding hip bar, manual set-up mode, pad system and straps.